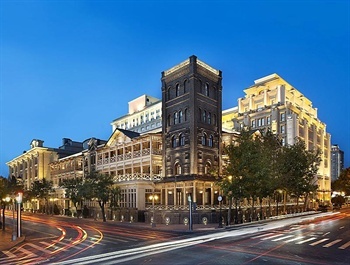 The Astor Hotel, a Luxury Collection Hotel, Tianjin, a central feature of the regeneration of Tianjin’s historic centre, the heritage gem evokes the romance of a bygone era with all the contemporary luxuries of a world-class hotel. The Hotel overlooks the Hai River in the heart of the Heping financial district. Hotel features 152 elegantly appointed rooms and suites in both classic Victorian style and more contemporary elegance. All rooms are equipped with 42-inch LCD TVs, CD/mp3 sound stations, Lavazza Capsule coffee machine and high-speed Internet access. Hotel features five exciting dining and wining venues. ShuiAn serves an authentic Cantonese and local cuisines, while Café Majestic is an all-day-dining restaurant with 24-hour A-la-Carte menu. For the extraordinary European cuisine, head to 1863 Bistro & Terrace which has more than one hundred year culinary tradition. The Victorian Lounge offers a wide range of beverages and British High Tea. The Award-winning British Gentleman bar – O’Hara Bar is famous for single malt whisky, selected wines, feature cocktails and live jazz show. A total of 730 sqm of conference and meeting space includes the Buckingham Ballroom with a fine domed ceiling, and the Windsor Multi-Function Rooms. Over 700 square meters of space is dedicated to the hotel’s own museum, a testament to The Astor Hotel’s long heritage and pivotal role in Tianjin’s development. The nearby pier, which is owned by the hotel, will be used as a jump-off point for river cruises. As a Luxury Collection Hotel, The Astor Hotel Tianjin provides a range of signature services, including ‘Luggage Liaison’, a suite of travel services including luggage storage and unpacking/packing services upon request, and ‘News Paper Direct’, a print-on-demand service for over 520 newspapers.